Its that special time of year again where we all get merry and wait for the big jolly fella to bring us some presents on the 25th of December. 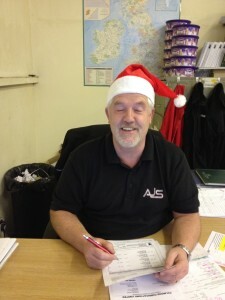 Here at AJS Profiles, we have our own Big Jolly Fella, Super salesman Bill Gould. He brings joy to all our customers 365 days of the year with his super quick quotes on steel profiles and lumsden grinding. The amazing thing is, Super salesman Bill Gould actually does looks like Santa Claus. He has the white hair, the white beard and that isn’t a pillow stuffed up the front of his jumper!!! !